Boutique Hotel Antinea is centrally located in Quito, a 3-minute walk from Foch Square and 8 minutes by foot from Mindalae Museum. This spa aparthotel is 0.8 mi (1.3 km) from La Mariscal Craft Market and 1 mi (1.6 km) from Pontificia Catholic University of Educador. Located in Quito, Wyndham Garden Quito is in the business district, a 4-minute drive from El Jardin Mall and 9 minutes from Atahualpa Olympic Stadium. This hotel is 2.7 mi (4.3 km) from Basilica of the National Vow and 3.1 mi (5 km) from TelefériQo. Conveniently placed in Ecuador, a strategic point in South America, the Hilton Colon Guayaquil hotel combines excellent service and a laid-back resort feel with a convenient location only a few minutes from José Joaquín de Olmedo International Airport.Select from 294 modern rooms and suites. Enjoy a spacious guest room and stay connected with wireless internet access. Get to work at the desk or just relax with a movie on the flat-screen TV. Connecting rooms are perfect for those travelling as a family. Step up to an Executive room or suite and benefit from extra space, a range of special touches and exclusive access to the Executive Lounge, where complimentary snacks and refreshments are served.Relax beside the outdoor pool at this hotel in Guayaquil, Ecuador under the warm tropical sun. Swim some laps or just sip on a cool cocktail from the swim-up Coco Bar. Stay active with a workout in the fully equipped Elements Health Club, or be pampered in the spa.With six restaurants and three bars, all tastes are sure to be satisfied. Choose from fine dining with an Italian influence in Portofino Restaurant; exquisite seafood and meat cuts on the grill at Vereda Tropical; fresh Japanese specialties in the Kioto Sushi Bar; local and international favorites at Cafe Colon, the hotel’s 24-hour buffet restaurant; or taste delicious quick options — ready to serve or take away — at Sal & Pimienta. With a stay at Hostal Urban Inn - Hostel in Quito (La Mariscal), you'll be a 3-minute walk from Foch Square and 12 minutes by foot from La Carolina Park. This hostel is 2.4 mi (3.9 km) from Quito Cathedral and 2.4 mi (3.9 km) from Independence Square. A stay at Alston Inn Hotel places you in the heart of Quito, a 2-minute drive from Foch Square and 10 minutes from Basilica of the National Vow. This hotel is 2.3 mi (3.7 km) from Quito Cathedral and 2.3 mi (3.7 km) from Independence Square. Featured amenities include complimentary wired Internet access, a computer station, and express check-in. A roundtrip airport shuttle is provided for a surcharge during limited hours. With a stay at Hotel Inca Imperial in Quito, you'll be within a 10-minute drive of La Carolina Park and Foch Square. This hotel is 1.5 mi (2.4 km) from Quito Cathedral and 1.5 mi (2.4 km) from Independence Square. The hostal offers spacious rooms, a sun terrace and free internet. It is located in the centre of Quito, just 2 blocks from Plaza Grande square and the Presidential Palace. 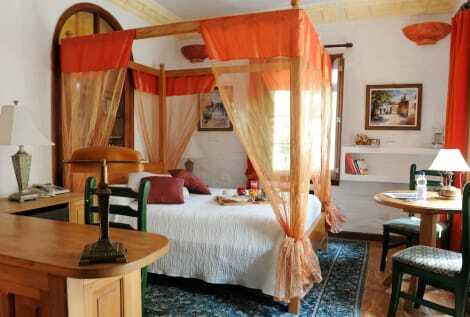 Rooms are colourfully decorated with painted walls and coloured sheets. Each room is unique and all offer city views. They feature wooden floors and the private bathrooms have showers with hot water. Some rooms also have a private balcony. Guests can enjoy an American breakfast each morning. The restaurants and bars are within walking distance. Guest can benefit from the 24-hour front desk service that is provided. Set in a colonial style building with patios, Hotel Fuente de Piedra I offers rooms with free Wi-Fi, and breakfast within easy access of the traditional La Mariscal neighbourhood . A bar and a restaurant are featured. Bellavista Metropolitan Park is a 10-minute walk away. Decorated with exposed stone walls, rooms at Fuente de Piedra I have carpeted floors and wooden roofs. All of them have large windows with city views, seating areas and satellite TV. Breakfast is served daily at Orquídea restaurant, which offers national and international dishes. Guest can unwind in the terrace or in the charming patios. Free parking is provided. Hotel Fuente de Piedra I is a 25-minute walk from Metropolitano Park, and 20 minutes from Mariscal Sucre Airport by car. Set in an ecological colonial style building in hectic La Mariscal district, Hotel Fuente de Piedra II offers rooms with free Wi-Fi and cable TV. A restaurant and a bar are featured. Quito historic centre is a 15-minute drive away. Decorated in lively colours, rooms at Fuente de Piedra II feature large windows and tiled floors. All of them have work desks. An American breakfast is served daily. La Fuente restaurant offers a wide variety of menus including ecuadorian and international dishes from Monday to fFiday. Guests can enjoy themselves reading a book from the library. The 24-hour front desk can secure shuttles to Marical Sucre Airport, which is a 50-minute drive away. Hotel Fuente de Piedra II is a 5-minute walk from El Ejido Park. lastminute.com has a fantastic range of hotels in Quito, with everything from cheap hotels to luxurious five star accommodation available. We like to live up to our last minute name so remember you can book any one of our excellent Quito hotels up until midnight and stay the same night.